A man exits his vehicle, clutches his chest and falls to the ground. A passerby sees him lying unconscious in the parking lot and calls 911. An ambulance is dispatched to the scene. This sequence of events is just one of the simulations that students can expect to encounter as part of Harlingen CISD’s Emergency Medical Technician program. 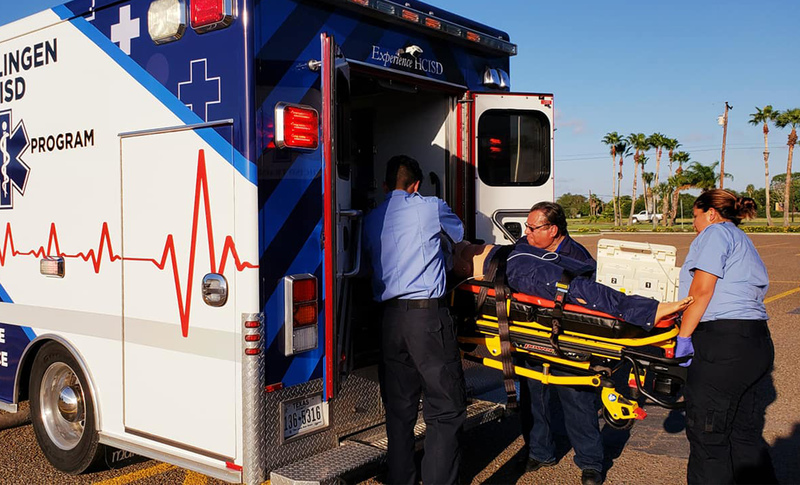 The district’s new ambulance, as well as a partnership with South Texas Emergency Care, is helping equip students with valuable hands-on experience as they work towards their EMT certification through the Public Services Academy at HCISD. This particular simulation allows students to practice the training they’ve received to help someone who has just suffered a heart attack. Two students tend to the patient by checking vital signs and applying chest compressions – a full-body training mannequin – while two others unload a gurney from the ambulance. Then they load him into the ambulance. “Our goal is to give our students in the EMT program the experience of how a real emergency situation would play out,” said Raul Alvarez, Director of Career and Technical Education. The district worked closely with EMTs at STEC to develop the EMT program. One thing that stood out was the importance of recreating the environment an EMT operates in, and that is where the new ambulance comes in. Formerly a fire-department based EMS, the new-to-HCISD ambulance, was re-outfitted with insignia denoting its status as a mobile training facility. Inside, the medical equipment, as well as the placement of equipment, adhere to strict state regulations that ensure safety, ergonomics, and ease of use by any EMT. Senior year students will start with in-class and ambulance training; they will begin practicing with a 175-pound mannequin. During their second semester, they will also have ride-along opportunities with real EMTs and paramedics in real STEC ambulances. In 2017, HCISD launched the Apprenticeship, Firefighters, Health Science, Media Arts and Communications, Teacher, and Transportation, Distribution and Logistics academies. Grounded in the 4 C’s – critical thinking, collaboration, communication, and creativity – HCISD Academies go beyond the realm of traditional, secondary education to ensure students achieve post-graduation success. To learn more about HCISD Academies, click here.